Britain's Eilidh McIntyre and Sophie Weguelin won 470 silver on the final day of the Sailing World Cup event in Hyeres, France. McIntyre, 19, was competing only a week after having a pin removed following a broken finger suffered in training. New Zealand's world and Olympic Champions Jo Aleh and Polly Powrie took gold, with Americans Anne Haeger and Briana Provancha picking up bronze. "It's been a really fantastic week," said McIntyre. "We've sailed really well but just started to get a bit tired towards the end of the week as our sailing fitness isn't really there. "But we're so pleased - to do so well in spite of that is really brilliant, and we've got lots of work on during May in our training. "We're in a great position [for the season], especially as we feel we weren't a million miles off. We were right there during the week and that's a really positive place to be." McIntyre and Weguelin, 25, in January. 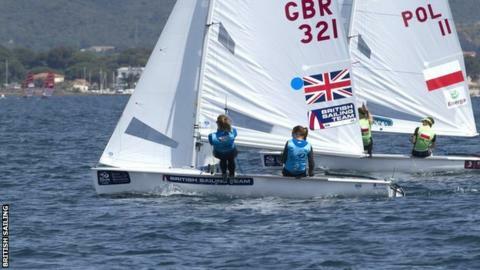 Britain's other medals in Hyeres came in the Paralympic classes on Friday, when John Robertson, Hannah Stodel and Steve Thomas won Sonar gold, with Megan Pascoe taking bronze in the 2.4mR event. Team manager Stephen Park said: "From the positions we were in at the end of qualifying you could have expected that we would have had better finishing positions than we did. "Clearly that's something that the coaches are going to have to look at with their sailors. "That said, I don't think that necessarily some of those finishing positions represent the progress that's been made by some of the sailors."